Fresh off winning a pair of district championships and acceptance to the Rose City Sing-Off, McNary’s girls and boys a cappella groups, Something Blue and Dangertones, will take the stage in the high school’s spring choir concert, Take Me Home, on Monday, March 20 at 7 p.m. in the Ken Collins Theater. Winning district wasn’t a surprise for Something Blue after capturing the Oregon Music Education Association state title in female vocal ensemble last year but they did feel the pressure to repeat. Madi Zuro, who is also in Something Blue, was a first alternate in soprano voice. The rest of the a cappella group includes Sydnie Gould, Carina Hodson, Veronica Reyes, Grace Condello, Camryn Runnow, Ingrid Dunn, Regann Donahue, Kennadi Thomas, Mary Dolenc and Jaden Brunhaver. They performed Mozart’s Ave Verum Corpus and This Little Babe by Benjamin Britten. Dangertones, which didn’t even compete at districts last year, were surprised to win male vocal ensemble. The group, which includes McNary students Casey Potmesil, Briley Hill, Ashton Thomas, Logan Boga, Austin Deng, Kyle Weltz, Erik Halvorson, Drew Faatz, Matthew Albright, Jacob Fritts and Dominique Williams performed Ave Maria and Ring of Fire by Johnny Cash for the judge. “You’re supposed to have two pieces and we had Ave Maria but we could not find another one and we were already working on that (Ring of Fire),” said Potmesil, who was also first alternate in bass voice. Hill said it was Rist who encouraged the boys to compete at districts to begin with. The OMEA state competition will take place April 28-29 at Pacific University. Dangertones and Something Blue are just two of nine teams that will perform in the Rose City Sing-Off on April 8 at Imago Dei Community in Portland, and the only school with multiple groups. 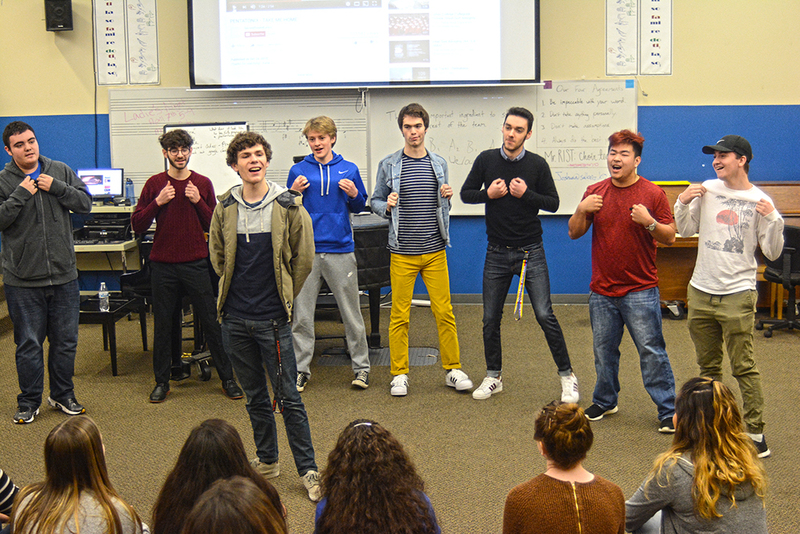 McNary’s a cappella groups will each perform three songs during the spring concert. The boys are doing My Girl, Ring of Fire and Right Round while the girls will perform This Little Babe, Bubbly and Ain’t No Mountain High Enough. McNary’s concert choir, Elektra, Celtic Men’s Chorus and the Classics will also perform a wide range of songs. “In the program for the concert we’re just looking for an interesting arc of styles and feels and moods so we’re touching a little bit of everything,” Rist said.